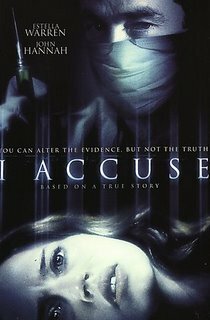 I Accuse is based on a true story. The story is about Dr. Schneeburger who drugged one of his female patients and raped her. But the twist was.... there was no DNA evidence. I saw it on "Forensic Files". This is a well-written and acted interpretation. Estella Warren plays the victim named Kimberly. She is partying one night and has to go to the hospital after cutting her hand. She wasn't treated, but drugged and raped by Dr. Darian (Hannah). Kimberly has a bad reputation around town as a tramp and no one believes her. She can't press charges because there's no evidence. John Hannah and Warren put in excellent performances. Hannah plays the evil doctor without going over the top. The mystery aspect is well-handled, but the courtroom scene near the end is a little overdramatic. Overall, worth seeing for the acting and interesting story.